On Friday I had the pleasure of talking to about 60 fifth graders from Robinson Elementary School in Redondo Beach. The school was having its annual “I am a Scientist!” Day which gets students excited about science through fun demonstrations and talks from members of the science community. The presentations this year included a wide-variety of topics such as the science of magic, science and engineering in a refinery, robotics, and matter and reactions. My talk was about physics. We learned that physics is the study of matter and energy, that matter is anything that takes up space and has mass, and that energy is the ability to do work. I told them that Einstein is regarded as the father of modern physics because he was able to relate matter and energy through his world-famous equation. at the wingtip traces the aircraft’s wake vortex. Then we talked a bit about fluid mechanics, the study of fluids and the forces acting on them. As an example I talked about a program created by NASA and the Federal Aviation Administration in 1990 where they studied wake vortexes. The swirling airflow from the wingtip of an airplane is its wake vortex, which exerts a powerful influence on the airflow behind the plane. Because of wake vortex, the FAA requires aircraft to keep a minimum distance between each other when they land and take off. The goal of the program was to boost airport capacity by determining conditions under which planes could fly closer together. 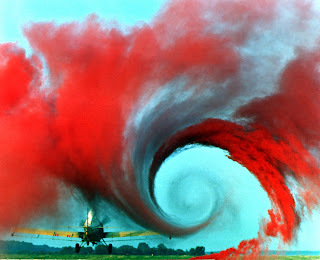 They studied wake vortexes using wind tunnels, flight tests and supercomputers in order to fully understand the phenomenon. Then they used what they learned to create an automated system that could predict changing wake vortex conditions at airports. For example, they confirmed that pilots don’t have to worry as much about wake vortex in rough weather because turbulent, windy conditions cause them to dissipate more quickly. Afterwards, we did a neat demonstration of how to create a vortex using a closed cardboard box with a circle cut out of the side and a fog machine. 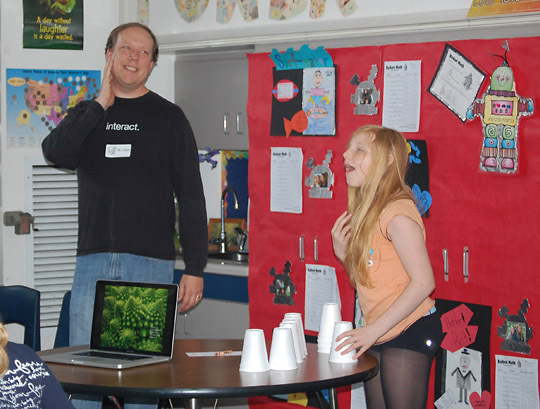 Everyone in the class was able to create a vortex and use it to knock over a stacked pyramid of styrofoam cups. It was a fun day and I was very impressed by how knowledgeable the kids were. Also, a big thanks to my daughter Daniella who was my capable assistant for the day. Hopefully we can do it again next year!